We’ve done it! London has officially become a cycle hire city, following in the footsteps of Paris, Copenhagen, Berlin, Munich, and a host of others. Seeing the Velib cycle hire scheme work successfully in Paris since its launch last summer, the London Mayor, Boris Johnson thought to himself, ‘Incredible, I’ll have a bit of that!’. After all, we can’t allow our French neighbours across the English Channel to be racing ahead of us in innovation now can we. As of July 30, the scheme will offer 10,200 docking posts at 400 locations across central London. The self-service will be available all year round. You pay an access fee and for the amount of time you use it (from £1 for an hour to £50 for 24 hours). And it gets better, as there will also be information in foreign languages so that tourists will be able to take advantage of the scheme, with maps at each docking station. However, helmets are not provided, but you do get adjustable seating and perhaps even a basket to make up for it. 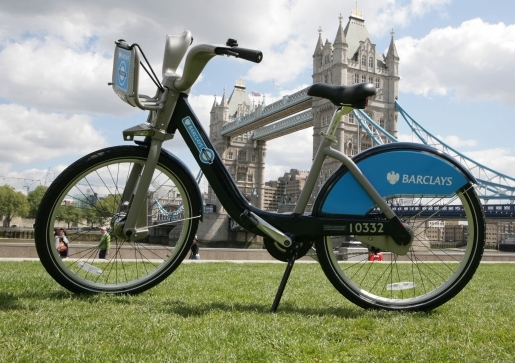 For more information on the Barclays sponsored scheme, including costs and registering, visit: Transport for London Cycle Hire. What more could you want from a city that offers Streetcar, Cycle Hire, the most Fair Trade products, free museums, gorgeous parks, multi-cultural diversity, social innovation galore, and believe it or not, lovely summer weather!? Well, at least for now anyway!